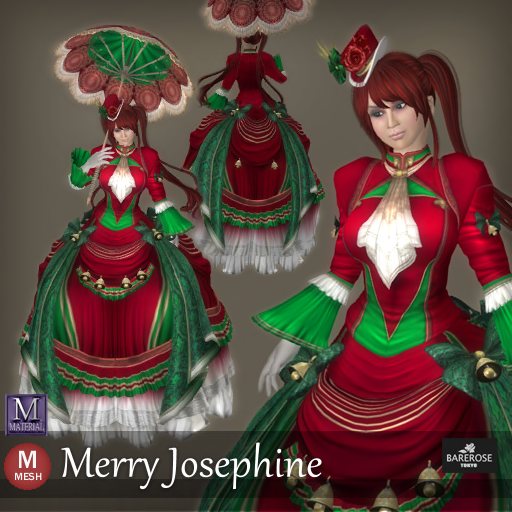 Bare Rose has lots of new Christmas outfit and Kitty is going to show you one of them named Merry Josephine! It is a long dress with lots of Red and Green and bells! To add to this almost perfect out for Christmas, is there a cute little umbrella so that you can be protected from the winter sun as well as snow. Look at how well the umbrella actually covers from the sun and keeps you in the shadow. That will save you a lot of $$ on cosmetics! Everything you see here is from the outfit excluding the antlers on the head which is part of the hair. Well how comfortable and warm this is for Kitty! Come join her on a winter teatime beside the cold stream?